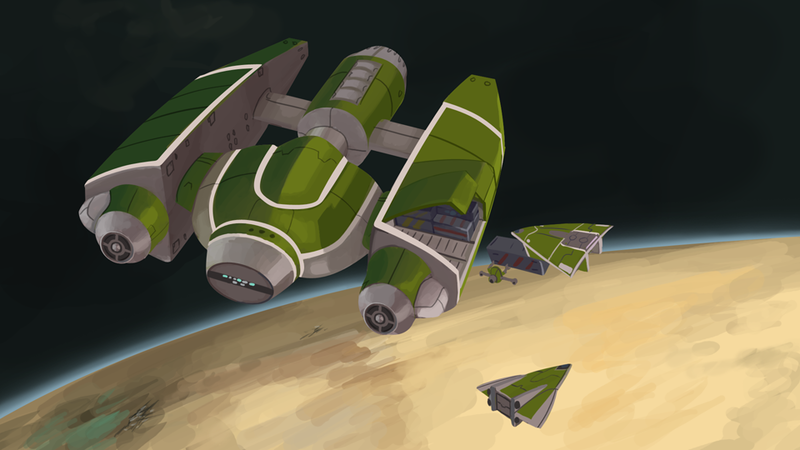 I'm not sure how the cargo ships are supposed to work, but at least in the Outsider universe I think, large ships don't usually land on planets. This was just me messing around and trying to come up with a look for something that had a challenging silhouette. Honestly, having a quick resupply method via standard sized shipping containers is a very good idea. Just pull the old one out slam a new one in. You are done in a few minutes as opposed to hours, days, or even weeks. Each Supply crate is labeled for the ship class, then done. Yes, and your solution is very nice. But I also like the little shuttles, they vaguely remind me of the Valkyrie from Avatar (in the sense that the hull "hangs" under the delta wing).